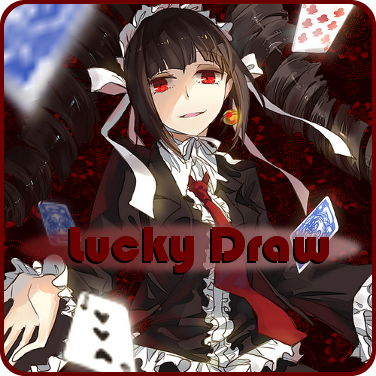 Lucky Draw consists of a full deck of cards along with both jokers for a total of 54 cards. Don't worry, we'll only be working with ten randomly drawn cards. I will then choose five cards out of those ten. Your job is to figure out what the five cards I chose were! This round closes on Friday, June 23rd Saturday, June 24th! Hello, Colors. 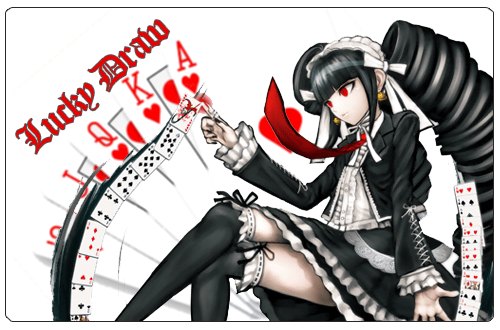 ♥ There are 52 cards and two jokers in a deck. I know what you're thinking right now. "This game isn't going to be choosing from all 54, is it?" No, no, it won't be like that. I have five cards in my hands. I will put ten cards at random on the table and you will have to pick the five cards that are in my hand. Just as a reminder, last round is still open until tomorrow (April 1st) around 8PM PT, so get your guesses in while you can! Do not be discouraged. The closer you get, the more prizes you will get. - All five correct: 10 cards, two choice cards, two crayons. - Four correct: 10 cards, two crayons. - Three correct: 8 cards. - Two correct: 6 cards. - One correct: 2 cards. - None correct: Nothing... So sorry. Pretty simple, isn't it? Though there is a bonus you can play, but you don't have to. - 1 special card: five cards extra to any prize. - 1 regular card: two cards extra to any prize. - All three: triple the rewards (includes crayons and choice cards) and two extra crayons but only if you get four or more right. NOTE: You can't put two stakes at the same time. Only one or the option of all three. If you get nothing right, you will lose the stake you had. If you choose to bet with all three stakes, you will lose the stakes if you get less than four right. May luck be with you. Very nearly the best hand. Last round's right hand was: A♠, 9♠, 9♣, 8♥, Q♥. A♥, Q♦, 2♠, 3♣, 4♠, 9♠, K♠, A♠, Black Joker, 7♠. If the symbols are not showing, they're the Ace of Hearts, Queen of Diamonds, Two of Spades, Three of Clubs, Four of Spades, Nine of Spades, King of Spades, Ace of Spades, Black Joker, Seven of Spades. The only hint is... last round's entry title. Last round's right hand was: A♠, A♥, 2♣, 3♥, 5♦! - All five correct: 5 cards, a choice card, a crayon. - Four correct: 5 cards, a crayon. - Three correct: 4 cards. - Two correct: 2 cards. - One correct: 1 card. A♠, 6♠, 6♥, 9♠, 5♦, 9♣, 8♥, 10♠, J♣, Q♥. If the symbols are not showing, they're the Ace of Spades, Six of Spades, Six of Hearts, Nine of Spades, Five of Diamonds, Nine of Clubs, Eight of Hearts, Ten of Spades, Jack of Clubs, Queen of Hearts. The only hint is... February's release had a deck with only numbers in it. Well, that's not really helpful, is it? Last round's right hand was: A♠, 2♣, 3♠ 5♣,7♠! Red Joker, A♠, A♥, Q♦, 2♣, 3♥, K♠, 5♦, 8♣, Q♥. If the symbols are not showing, they're the Red Joker, Ace of Spades, Ace of Hearts, Queen of Diamonds, Two of Clubs, Three of Hearts, King of Spades, Five of Diamonds, Eight of Clubs, Queen of Hearts. The only hint is... this sequence was introduced in the book Liber Abaci.